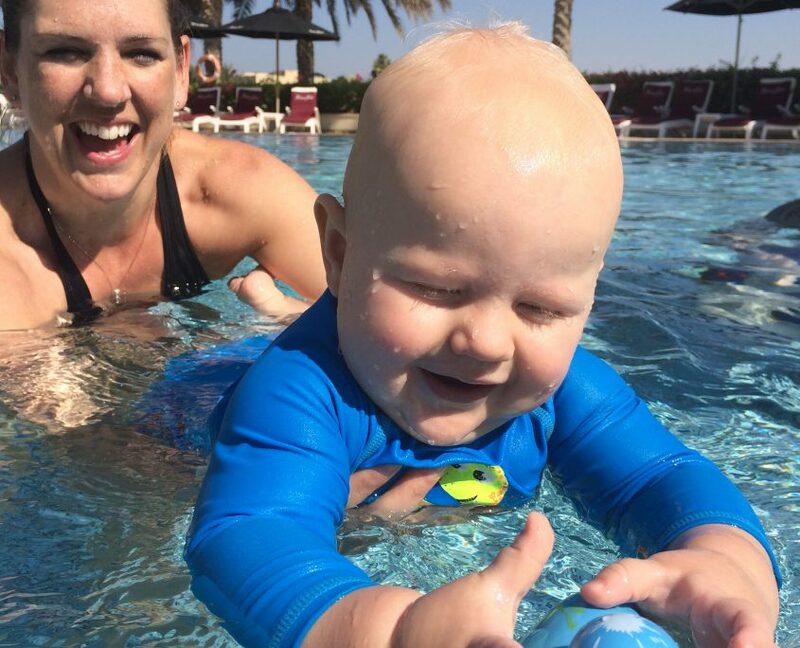 Our classes have been running successfully in Dubai for over 14 years, starting at the Lakes Club 2003 by Helen Bone-Knell, who at the time could see there were no swim schools in Dubai specialising in teaching young children. Drawing on her experiences in teaching in the UK, she set up a dedicated programme for babies and young children. 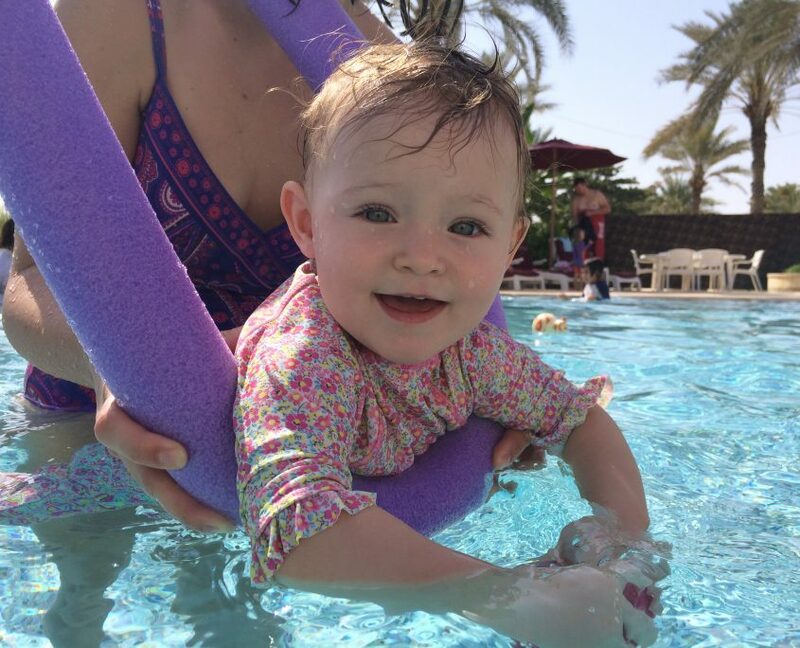 During this time over 4000 babies and toddlers have splashed their way through our unique fun filled lessons which are taken by a small passionate team of amazing ‘fully qualified’female swimming instructors with additional experience / qualifications in infant swimming, and all trained through BabySplash. Our classes are a unique way of introducing young children to water in a fun, creative and safe manner, which both Mum (or Dad) and their little one can enjoy. The benefits of these fun sessions in the water can be far reaching for your child! All our classes are child centered, and will move at the level of your own child. We do not believe in ‘Conditioning’ which is a one to one method of teaching a child to learn certain actions in the water by repeating them over and over on a regular basis over a period of time. 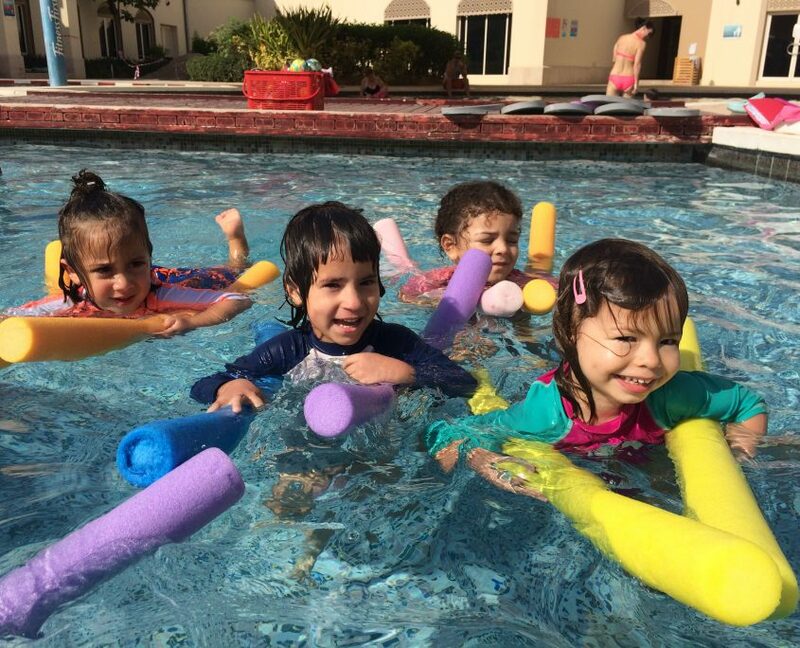 We strongly believe that if a child is confident in the water they will learn to love water and learn to swim at their own pace in a happy environment with the encouragement and love of their parents supporting them. We believe in progression through positive encouragement. By getting young children familiar with the basics of kicking their legs, laying on their backs and tummies, and submerging with mum or dad close by, these lessons leads naturally to a smooth transition towards formal swimming lessons for your little ones from 3.5 years old. WHAT Age Can We Start ? Our classes are designed specially for children from 3 months old to 3.5 years. *All age ranges above are approximate and are always based on the individual child, their abilities and class demands. We have had a number of babies start earlier than 3 months. Please ring us if you wish to discuss this. 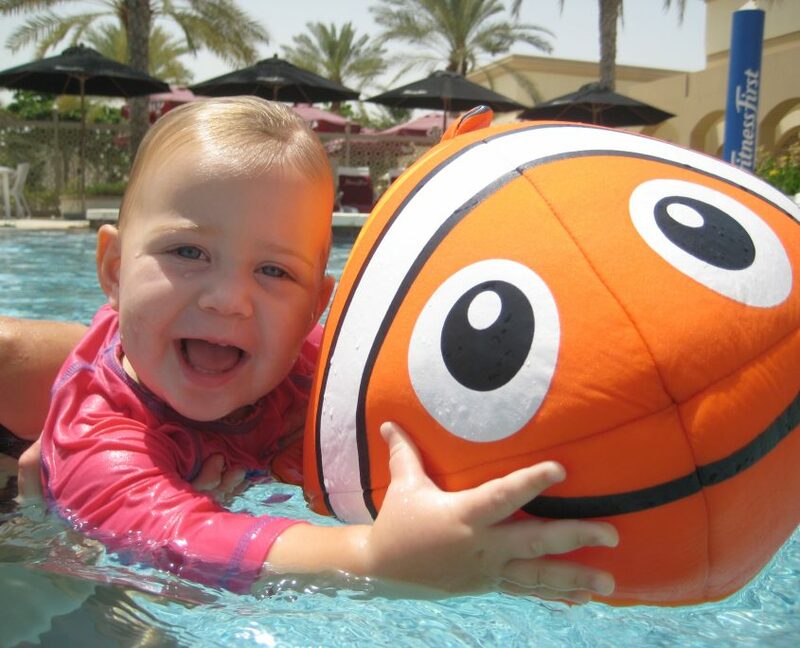 Immunisation – There is currently no requirement in the UAE for babies to be immunised before starting swimming. Please note – Should you have any questions or concerns regarding immunisations and when your child can begin swimming lessons, please contact you doctor to discuss. Baby Swimming have a number of benefits for you and your baby from water confidence to creating a special bond with parents. It is well documented that Baby Swimming can help develop strength, muscle tone, lung capacity and co-ordination. It also offers young children the ability of movement in the water, exercising muscles that ordinarily would not be used on land. As children get older swimming increases co-ordination and moter development and most parents notice better appetite and sleep patterns after swimming. Young children learn to enjoy a whole host of new sensory inputs from early swimming activities. 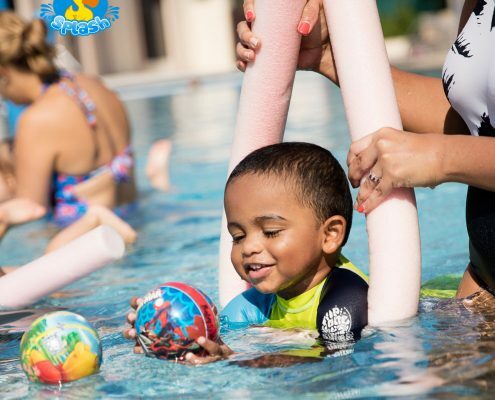 Babies and children alike can enjoy the freedom and texture of the water by simply splashing their hands and are visually fascinated by bubbles and droplets of water. To give parents confidence how to hold and support young babies in the water. Building general water confidence, by encouraging reaching and grasping, Paddling hands Kicking legs, assisted floating, Build confidence for short underwater dips. Introduce use of noodles. Following on from the above, increasing confidence with catching and throwing objects, and paddling arms. Blowing bubbles, encourage as much independence as possible with noodles. Encourage leg kicking. Lengthen under water dips. Release and glide underwater. Jumping in unaided, encouraging turning. Listen to commands. Pick up objects from steps. Following on from the above, encourage stronger kicking and arm pulls. Confident to put face in the water. Swim short distance on front independently. Jump in unaided on command and turn back to the side. Back floating. Back swimming with aids. Pick objects up from bottom of pool. 1. A ‘parent’ MUST be in the water with their baby or toddler for each lesson. 2. Swim nappies MUST be worn by all children during their lesson. Click here to purchase your swim nappies !! 4. Sun protection i.e a UV swim suits and a hat for children are essential or sun screen. 5. All other swimming equipment required for our lessons is provided by the instructor.